The move eastwards to the Cairngorms gifted us with a day of sunshine, but it wasn’t going to last. We toyed with a long strenuous walk up Cairngorm and Ben Macdui but cloud was still lingering on the summits and it was pretty windy, so in the end opted for something a little less difficult with more chance of sun. 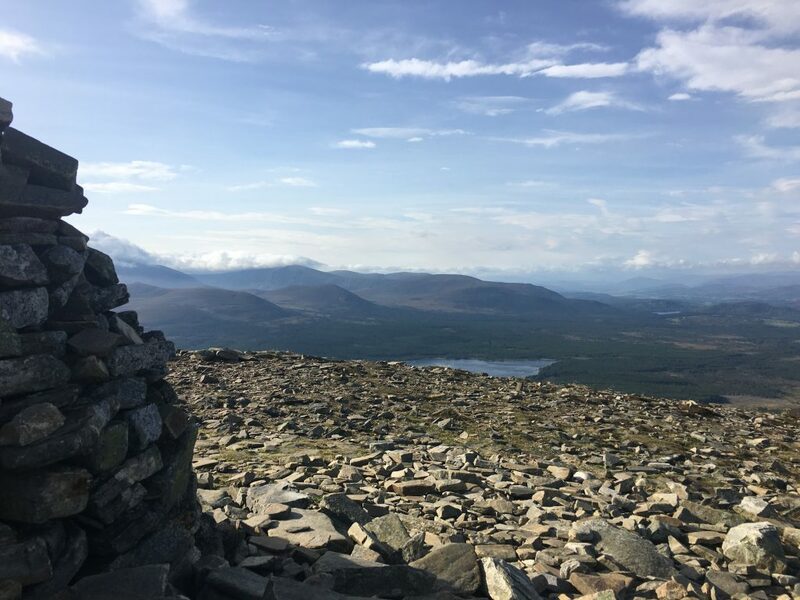 Meall a’Bhuachaille means ‘Hill of the Shepherd’ in Gaelic and is a popular walk in the Glenmore area. As it was a Saturday and good weather we thought we had better start early. 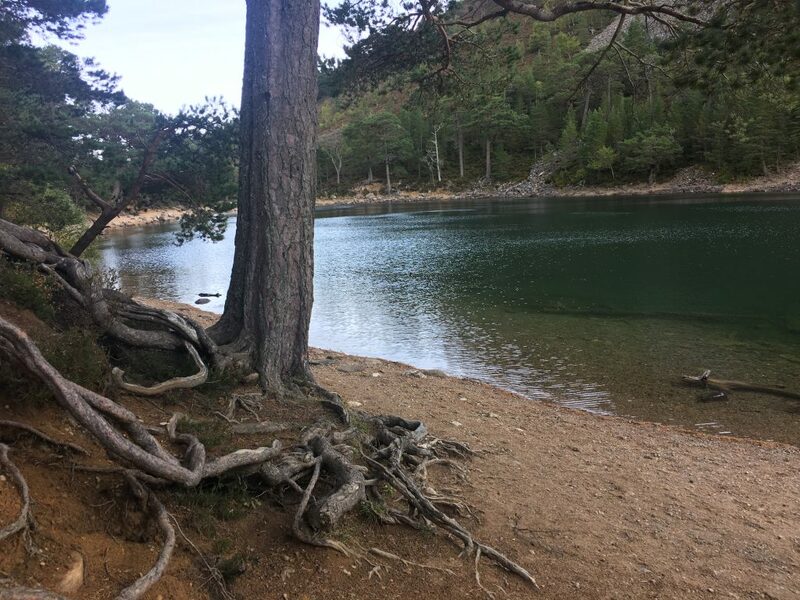 We set off from our parking area walking along pleasant level paths through the Glenmore forest for the first couple of miles until we reached An Lochan Uaine (The Green Lake) which, true to it’s name, had a verdigris tint. Until this point we had been alone, but as we sat here for a short break we were caught up by a group of mountain bikers and a couple of walkers. Shortly after the loch we reached the bothy at Ryvoan, by now we were out of the forest and we could see the path zigzagging up the slopes of the mountain. Rather incredulously we realised that the mountain bikers were planning to take this path; we watched as they set off, some riding and some pushing up the steep uphill path. We followed them up and then overtook them as the hard work of pushing the extra weight up a mountain started to take it’s toll. The path was unrelentingly uphill, but only just over a mile to the summit. We had no incentive to stop on the way as the wind was ferocious, but at the summit there was a large cairn/shelter that we could use to prtect us from the wind. We quickly nabbed the most sheltered spot before other walkers and the mountain bikers arrived and settled down for some lunch and our hot drinks from our flasks. We were in sunshine but there was still cloud across the tops of the higher mountains so we were glad we’d chosen this route. When the mountain bikers reached the top we got chatting to one of them, they were a club who were on a guided mountain biking weekend. 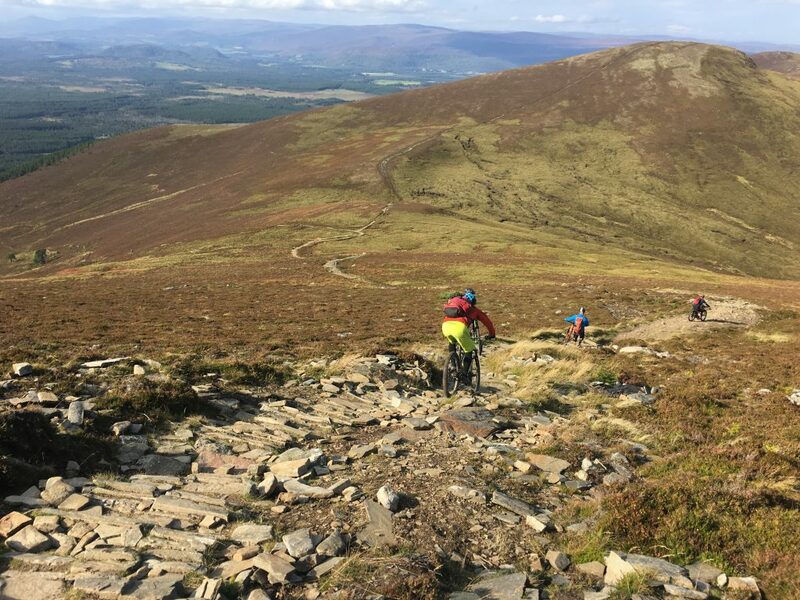 Their guides had taken them to Ben Macdui the previous day which had been hard work and this ride was the ‘easy’ day. Apart from the guides it really didn’t look like anyone was finding it easy. They had had two people drop out already. Despite being a fan of outdoor activities I had no desire to emulate their adventures. We set off down the western slopes of the mountain into the bealach (the name for a low point between two hills) from where we were going to descend back to the forest. As we walked down we heard the sound of bikes coming down the hill and stepped aside to let them past. The path was well constructed for walkers, which mean it comprised of large stone cobbles, not quite steps. The thought of cycling down these paths gave me butterflies in my stomach and it was evidently doing the same for those on mountain bikes as they cautiously descended with their brakes on (or just dismounted and walked their bikes downhill). Obviously the guides whizzed down making it look easy. They stopped at the bottom of the section of path for a breather (and to get their nerve up I expect) where we overtook them and we played leapfrog down the hill for about a mile until two of them got punctures and they were left behind us. 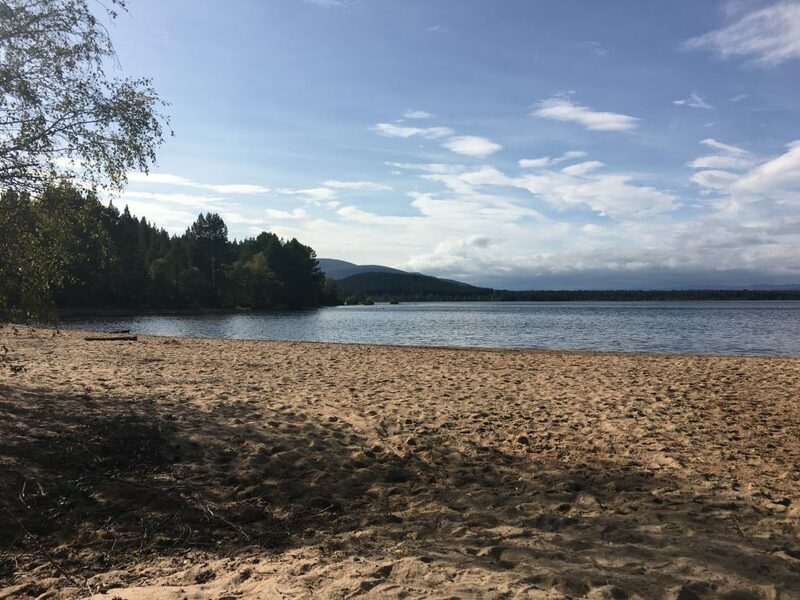 We descended back through forest and across the road to Loch Morlich where we sat on a sandy beach and watched the many day-trippers enjoying a day out. Finally we followed the path alongside the river before we crossed the road again and made our way back to our parking spot. 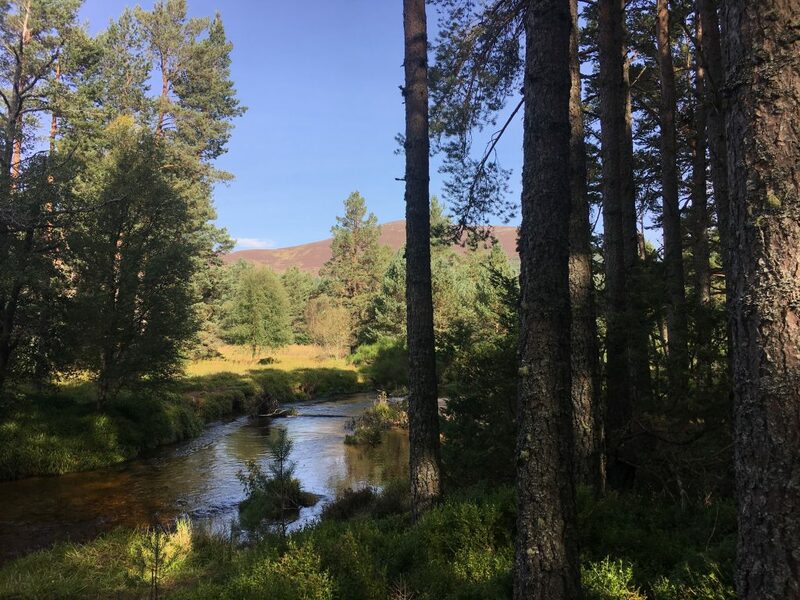 It had been a really nice walk with varying scenery and although the mountains of the Cairngorms don’t inspire me in the same way as those of the west coast I could see why they were popular. 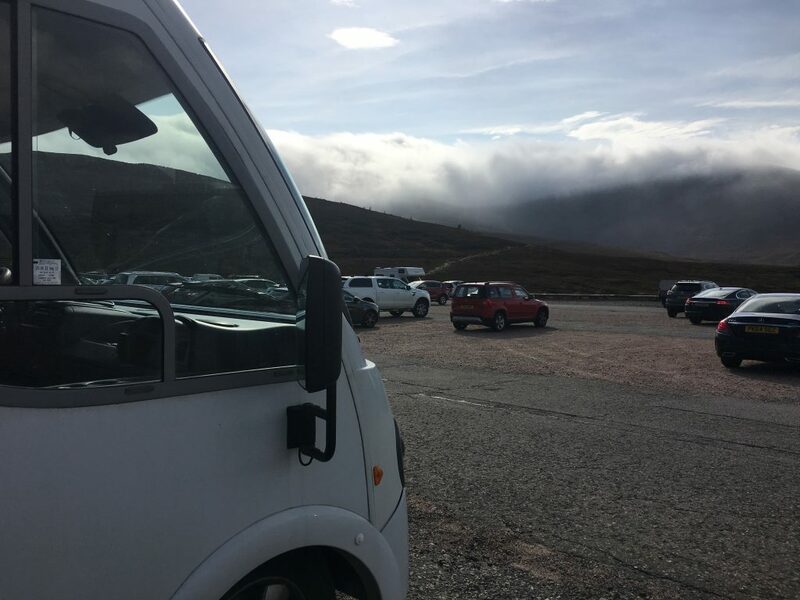 We thought we would pop up to the Cairngorm Mountain Railway carpark, a recommended overnight parking spot. We knew it would probably be too windy for us to stay there but wanted to check out the views. It was pretty spectacular, although the mountain tops were still under a localised blanket of cloud, but it was also spectacularly windy and there was no way we would be able to sleep there. We had already decided that we would probably head back to a mountain biking area at Laggan, so off we toddled. The advantage of this spot was that the mountain biking centre had showers. For £1 we could get a decent hot shower, and as we had nearly run out of water this was ideal. It also had free wifi which we used that evening by driving as close as we could get to the centre in order to pick up it’s weak signal.